← Public service for Liberals. Complete list of businesses to boycott over Obamacare. 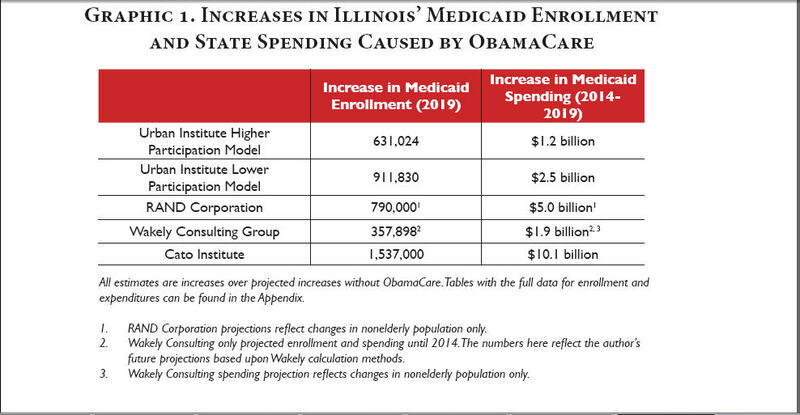 The unsustainable cost of Obamacare in Illinois. $28 million went to 44 “community groups” in Illinois that will be conducting “outreach” providing “education” and facilitating enrollment in the Illinois Obamacare Exchange through the IPA – In Person Assister – program. $35 million went to PR firm Fleishman Hillard to market and promote the Illinois Obamacare Exchange. 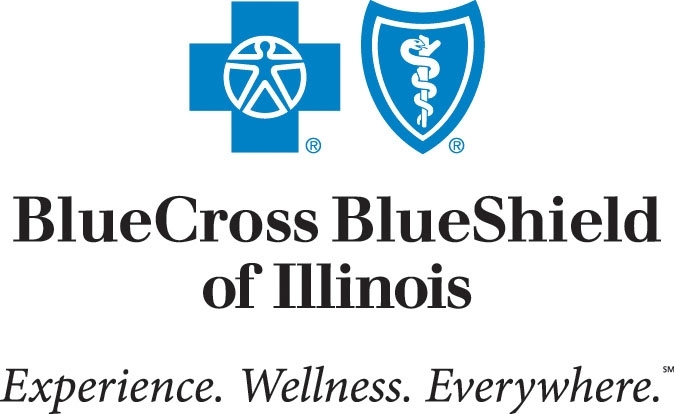 The firm, along with several partners, will lead a massive multimedia outreach and advertising campaign to promote enrollment in the Illinois Obamacare Exchange. $66.5 million went to a CANADIAN firm known as CGI Technologies and Solutions who will be responsible for setting up and maintaining the Illinois Obamacare Exchange which will also interface with Illinois’ eligibility system for Medicaid. Because you know, we’re adding an estimated 700,000 people onto our already bankrupt Illinois Medicaid program. Whether you use the Kaiser Family Foundation estimates, the Cato Institute estimates or the Congressional Budget Office. The expansion of Medicaid under Obamacare will put a significant new burden on the taxpayer. This is because Obamacare promises 100% matching federal Medicaid dollars for years 2014 through 2016 and 90% for years 2020 onward for states that elect to expand their Medicaid rolls. Even President Obama’s Medicare Actuary Charles Blahous doubts that promise. Most especially since the President’s own submitted budgets, as well as the bipartisan Simpson–Bowles Commission, and the budget resolution passed by the House of Representatives in 2012 already call for trimming Medicaid spending by a minimum of $100 billion. Whilst the Obama administration touts the fact that Obamacare calls for the aforementioned matching federal funding for those who will be newly eligible for Medicaid in 2014. It is far less vocal about the fact that it only provides the existing or Traditional FMAP percentage match rate for the millions of Americans who were always eligible for Medicaid but either never knew they were or never bothered to enroll. These ‘old eligibles’ will now be required by federal law to maintain ‘minimum essential coverage‘ via Medicaid. Which means the vast majority of them will be enrolling in 2014 in order to avoid problems with the IRS. 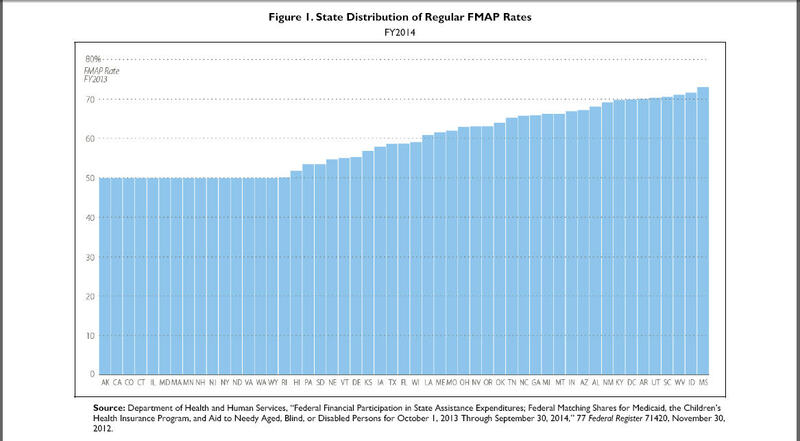 How much will the Traditional FMAP federal percentage match be in 2014? In states like Illinois and others it will be only 50%. Who picks up the other half? That’s right, the state tax payer. Keep in mind Illinois taxpayers that this new tax increase will be in addition to the 66.66% tax increase Governor Quinn already imposed upon you in January 2011 and the $350 million additional tax increase in May 2012. How much will picking up the other half of the cost to enroll ‘old eligibles’ (‘woodwork’ population) and the cost of enrolling ‘new eligibles’ cost Illinois taxpayers? See chart below. Look at CATO’s estimate of $10.1 billion. The Obamacare ‘fix’ to Medicaid reimbursement rates to doctors. Another state budget buster will be the Obamacare ‘fix’ to Medicaid reimbursement levels to doctors. You see the PPACA’s answer to improving Medicaid is to raise the amount the federal government pays to doctors who take MedicAID patients to a level commensurate to what the federal government pays to doctors who take MediCARE patients. Their thought process behind doing so is that more doctors will accept Medicaid under this arrangement because the reimbursement rate will be far higher. There’s only one problem. The federal government only provides funding for this massive increase in Medicaid reimbursement ratios for the first 2 years. Afterward, state tax payers are on the hook for the rest. This, more than anything else related to Medicaid expansion is a fiscal ticking time bomb for state budgets and one that is not being discussed nearly enough. Furthermore, just wait until hospitals – who are forced to treat emergency patients under EMTALA – start pressuring states for reimbursement of more than $11 billion in annual federal payment cuts for uncompensated care. Hospitals are a powerful lobbying force and they will lobby hard for that money. The Illinois Policy Institute predicts that 1 in 3 Illinois residents will be Medicaid recipients by 2019. And, on January 30, 2012, the Civic Federation released its “Budget Roadmap” for the coming fiscal year. In it, they highlight the fact that state officials now believe that the Illinois Medicaid program will have between $21 and $23 billion in UNPAID bills by 2017. ‘Forward’…. to bankruptcy. The worst part about this expensive expansion of Medicaid is that according to multiple studies completed by Johns Hopkins, the Journal of the National Cancer Institute, Columbia-Cornell, the University of Pennsylvania, the University of Pittsburgh, the American Academy of Cardiology and the New England Journal of Medicine, Medicaid patients in bankrupt states like Illinois & California wait twice as long to see a doctor or specialist as those with private health insurance. And, often times they are denied the care they need. And, Medicaid surgical patients have far worse health outcomes than those with private insurance. In fact, in the largest study of it’s kind (with nearly 1,000,000 participants) the University of Virginia found that Medicaid surgical patients are 97% more like to DIE than surgical patients with private health insurance. There are intelligent alternatives to simply flooding our bankrupt Medicaid rolls with 17 million more Americans. In fact, these alternatives have already been proven successful in states like Florida, Indiana and Louisiana. Sadly, our Democrat Governor Pat Quinn and even Republican governors like Arizona’s Jan Brewer and Ohio’s John Kasich haven’t learned a thing from these successful reforms. Instead, they have chosen to double down on failure by expanding Medicaid to historic proportions. Worse yet, they want you to pay for their wrong headed decisions via higher taxes and more ‘cost shifting‘. Both of which will do nothing but continue to increase the cost of health insurance for everyone else. It gets better! There is a good possibility the State will have no way of processing Medicaid claims that complies with the ACA after the company they are dealing with get indited. Or the claims will be processed in India! Happy happy happy! And if they get indicted it will ONLY be due to the combined efforts of you and your whistle blower & Adam Andrzejewski for helping make it public. bankrupt the federal government and install a socialist system.